One afternoon, after making a batch of garlic confit, I realized that I still had about 900 billion cloves of garlic left, and I still hadn’t figured out dinner. We’d dined out quite a lot that week, so the fridge was pretty empty, as were our wallets. I ran to the grocery store, and bought some cheap bone-in, skin-on chicken thighs, which happen to be my favorite anyway. As I drove home, my mind started to work around a 40 garlic cloves chicken recipe. Garlic (as well as all the other alliums) is a VIP in our household, and any super garlicky dish has my husband clamoring for seconds. I figured a braise on the chicken thighs would work wonders on both the meat and the garlic, and mimic the confit I had made earlier. In my opinion, braising is just about the easiest cooking technique, because it has such standardized steps: season and sear the meat. saute your mirepoix (or whatever aromatic veggies you’re using) in the residual fat, then deglaze the pan. Place the meat back in, add liquid, cover with a lid, and cook low and slow. Those are the key words: low and slow. That means a low cooking temperature, and cook it slowly, over a long period of time. You can do this with any kind of meat, though tougher cuts work best. Braising is responsible for the “fall off the bone” “could eat it with a spoon” phenomenon. A classic braise will use the braisage (the liquid that the meat cooked in) as a sauce by straining it and reducing it to a thicker consistency. In this recipe, blending the garlic into the braisage makes the sauce thicker, but you can also reduce it a bit over low heat to concentrate that garlicky flavor even more. The first iteration of this dish was served with beet risotto and was amazing, but I wanted it to be more of a one-pot, one-pan dish. 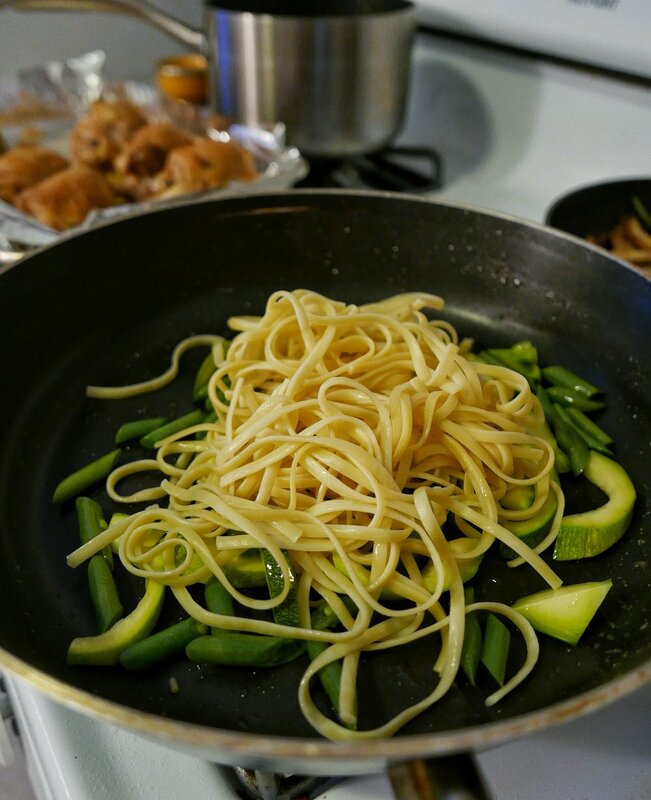 I’m a huge fan of linguine, and I thought the garlic sauce would go great with pasta, so the next time I made this, I sauteed some green veggies, added al dente noodles, and finished them in the sauce. What resulted was a velvety, garlic pasta sauce brightened up by the still-crunchy vegetables, topped with that “melt in your mouth” chicken. You can swap any starch in for the pasta (the husband also likes rice) and rotate in different veggies as you like, making this dish super versatile. The most important note about this recipe though, is don’t be afraid of the garlic. There really is no amount of garlic that is too much in this dish. I’ve recommended using a head of garlic per chicken thigh in this recipe, but honestly, I often do a handful of garlic cloves per thigh when I cook it, if not more. It cooks down into that roasted garlic sweetness, and you won’t even notice the garlic breath. Peel garlic, and set aside. Place chicken on plate, skin side up. Season liberally with salt, but do not salt the underside. Heat a large, oven safe saute pan over medium high heat. 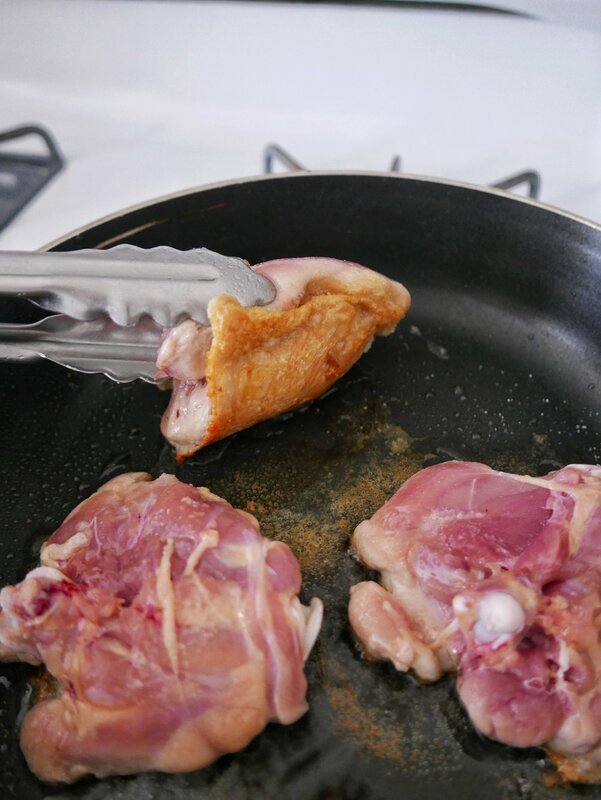 When it is hot, place about three thighs skin side down in the pan, without crowding. Season the bottom of the chicken thighs with salt. Let the fat render and the skin crisp up, about 8-10 min, and when the skin is golden, flip the thighs over. Fry the thighs a few more minutes, until the bottom is just starting to brown. 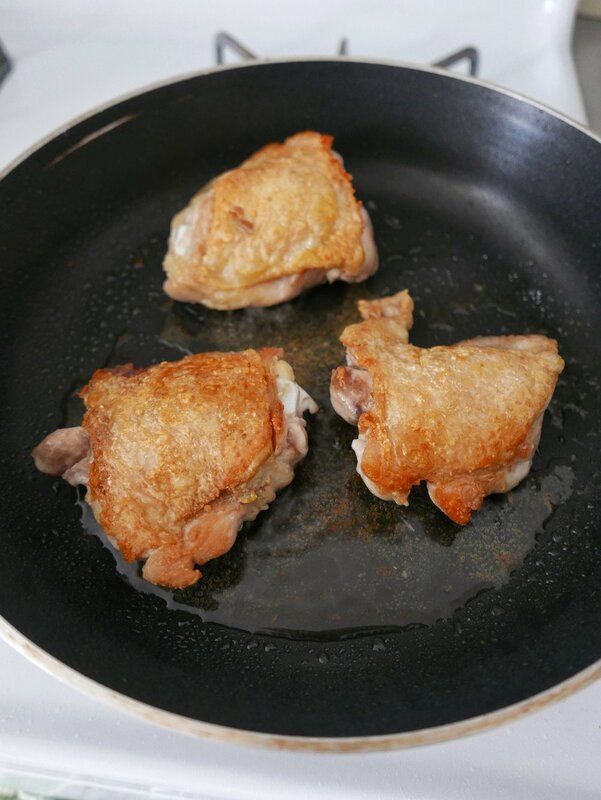 Remove thighs from the pan onto a fresh plate. Repeat with remaining thighs. If necessary, drain the pan of fat, but reserve this liquid. When the chicken is done searing, add any removed liquid back to the pan, lower the heat, and add all the peeled garlic. Allow the garlic to sizzle over a low heat, until golden and fragrant. Add bay leaves, white wine, pepper, ginger paste (if using), toss to combine, and let simmer for about 2-3 minutes to bring flavors together. Place the chicken thighs skin side up on top of the garlic, and add chicken stock until just the skin is showing. Bring to a low boil again, then cover the pan with either a lid or foil, and place in the oven. Let cook at least 3.5 - 4 hours, but can be kept in the oven as long as 6. While your chicken is cooking, prepare your vegetables. Good choices for this dish are veggies without a lot of water content, or that can be cooked at a high heat to remove water content, like bok choy and mushrooms. For vegetables like zucchini and squash, make sure to scoop out the seeds to minimize added liquid. 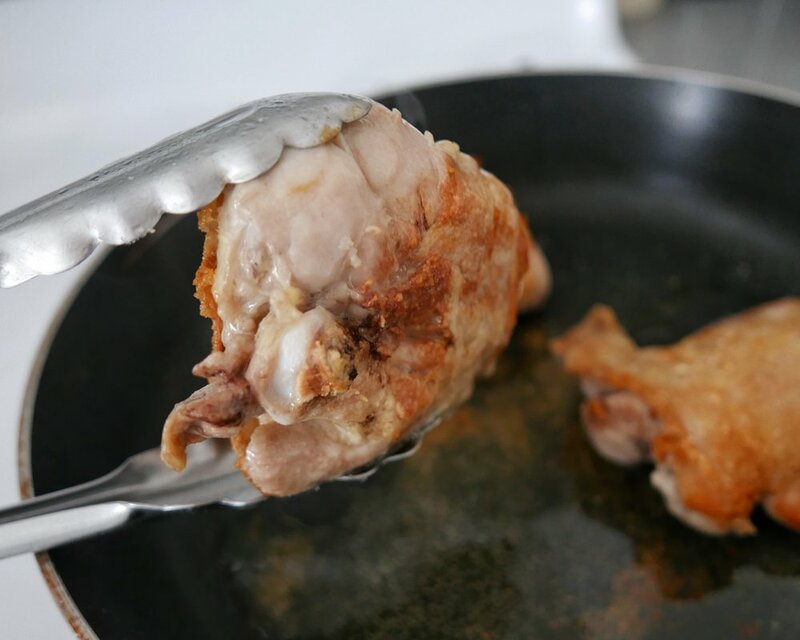 When chicken is done, carefully remove the pan from the oven. 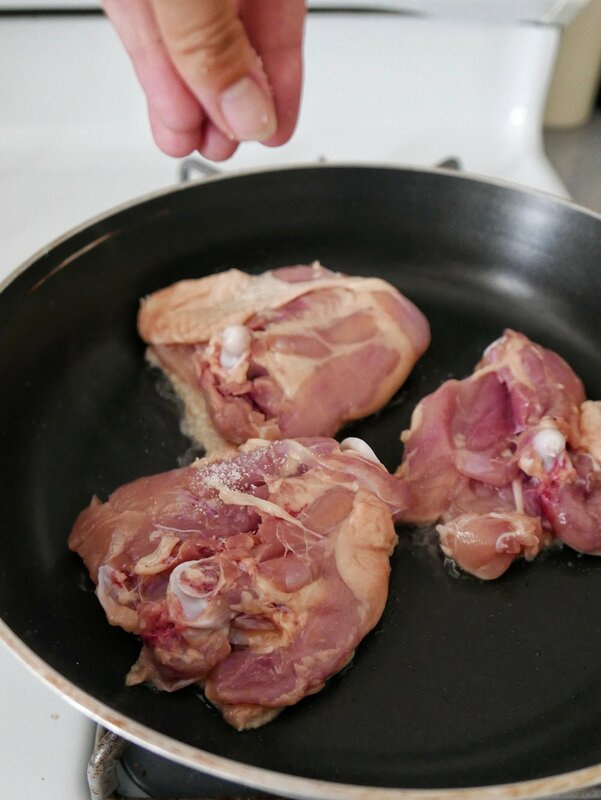 Take off the cover, being cautious of steam, and gently transfer the chicken thighs to a plate. They will be delicate. Discard the bay leaves. Transfer everything left in the pan into a pot, keeping the pan for further use. 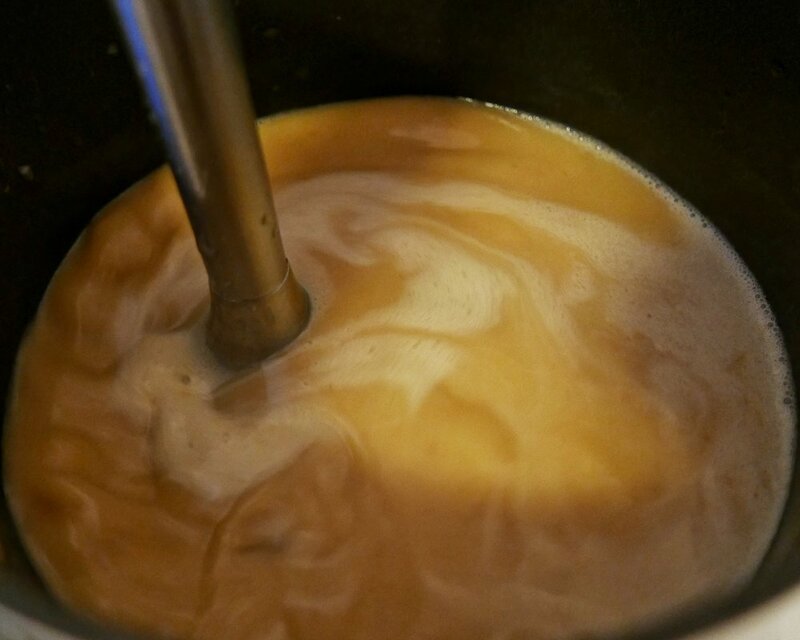 Using a hand blender, blend the garlic into the cooking liquid, until smooth. Keep pan over low heat. Place the pan over medium high heat, and add a little oil if the pan looks dry. When the pan is hot, add the vegetables, with a little bit of salt, and give them a quick sear. Once vegetables are starting to cook through, about 2-3 minutes, add your starch and let fry for another minute. Ladle enough sauce over starch and veggies to almost cover them, then bump up the heat. Bring the sauce to a fast boil, to thicken and to finish cooking both the veggies and the starch. After about a minute, take off the heat and plate with the chicken. Spoon more sauce over as desired.